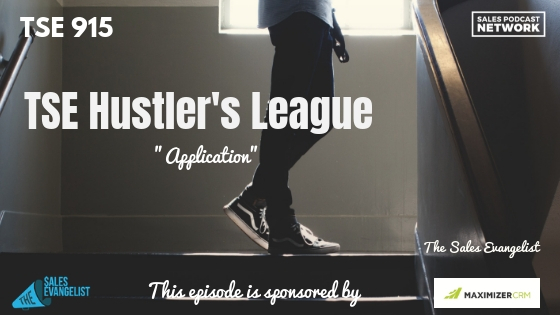 TSE 915: TSE Hustler's League-"Application"
Early on in The Sales Evangelist, I didn’t have an application process in place to qualify my inbound leads, and it cost me customers. I suspect you could be missing this connection, too. 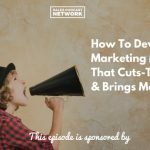 On today’s episode of The Hustler’s League, I’ll share what might have prompted some of my customers to leave my program, and how an application improved my retention rates. TSE Hustler’s League is an online group coaching program designed to help sales professionals who haven’t had sales training, as well as sales teams that want to learn and find something new. Each semester we have a theme that we focus on, and we do a group call each week that includes a training about that topic. This semester, our focus is on business development, so we’ll spend the whole three months talking about it. Early on, I didn’t have a lot of money to pay for sales training. I barely had enough money to pay for rent, so sales training was a luxury I couldn’t afford. I decided to figure out ways I could learn about sales myself, but it was challenging to find relevant content or people who were willing to help. Eventually, though, my company paid for sales training, and it was amazing. I was digesting new things and learning about sales, and I spent two hours every single Friday practicing what I learned. I was determined that someday, I was going to do something like that myself, so I created inexpensive, online content that anyone could use to practice what they were learning. Initially, we charged $1 for the first month and then $37 for the following months. We quickly realized, though, that we needed to have an end date rather than continuing that structure indefinitely. So we focused on a semester approach and we themed each semester so our customers could return to later groups that covered different material. We did notice, though, that people started to fall away. They weren’t committing to the program or they quit participating. Some unsubscribed. I figured out that my problem was a lack of qualification. All users had to do was go onto the website, read through the information, and sign up to try the classes. To address the problem, we added an application. You have to fill out an application at the beginning that asks you to share the biggest challenges you’re facing and asks you to indicate which program might be the best fit for you. We also include the pricing up front, because we don’t have any secrets. There’s a time commitment for those in the course of one hour per week. For that one hour, I’m virtually live with those in the program. The application allowed the people who weren’t right for the program to weed themselves out. They saw the requirements and the price point, and they saw the value they were getting. They had all the information they needed to determine the valuation for themselves. After the application, they schedule a time to do an interview with one of our team members. We review the application and make sure they understand what they are getting into before they even make a payment. To some, that seems like a process that is costing me money. Just the opposite, it’s saving me headaches. I don’t have people complaining about the process and our fall-off rate has dropped tremendously. People weeded themselves out without us having to be involved, so by the time we interviewed them, it solidified their commitment to the program. We have a stronger retention rate and now we have a program that is easier for companies to join. Sales managers know exactly what the members get from the training, and we’ve developed a certification that confirms completion of the program. 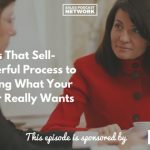 How can you apply this to your own process? For us, this was sales qualified leads. If they were marketing qualified leads, they might have been people who signed up and downloaded a free document, but people who still required nurturing to get to an appointment. Simply asking applicants to type out their three biggest challenges made our conversation easier and it gave me information I could use in my discussion to see if they are a good fit for the program. If, for example, they are having a problem building value in the conversation, I know the business development track won’t be a good fit for them, so I won’t sell them something that isn’t a good fit. I want my retention rate to be stellar. I would encourage the person to wait for a later semester that addressed building value so they would learn something helpful. When I’m able to make sure the expectations of the buyer and the seller are in sync, then magic happens. And then I’m able to raise the price because the value is better. The program is $150 a month now for three months, which is a steal compared to some of the other training programs out there. Each semester I meet new people and I absolutely love it. If all of this sounds great to you but you still aren’t sure how to start, check out The Sales Evangelist Hustler’s League, our online group coaching program that brings sellers of all levels and all industries together to share insights.